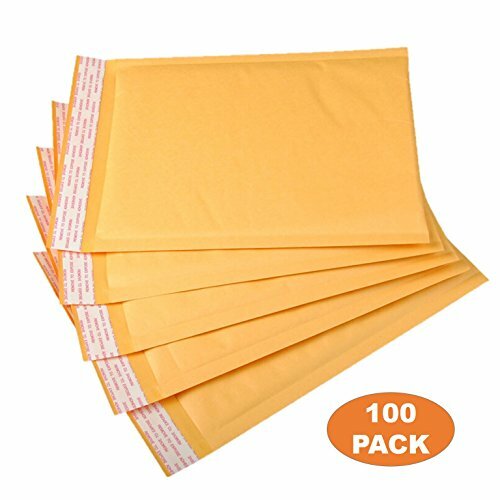 OfficeKit Kraft Bubble Mailers #0 6X10 Inches Shipping Padded Envelopes Self Seal Cushioned Mailing Envelope Bags 100 PACK by OfficeKit at KBFS. MPN: OKKBM_6X10-100. Hurry! Limited time offer. Offer valid only while supplies last. Bubble mailing bags are the lightest type of cushioned shipping bag made. The savings in postage costs can more than pay for the price of these bags. Bubble mailing bags are the lightest type of cushioned shipping bag made. The savings in postage costs can more than pay for the price of these bags. Clean, tough, air bubble lining is covered with strong, goldenrod kraft paper. Sometimes called bubble envelopes or padded envelopes. These bubble bags close quickly and neatly with a self-sealing adhesive strip. If you have any questions about this product by OfficeKit, contact us by completing and submitting the form below. If you are looking for a specif part number, please include it with your message.